In my previous blog entry, I said that Tuli's new prototype Hope skin reminded me of Gala and D-Skin because of the beautiful face. Well, here's a picture of all 3 side-by-side for your viewing pleasure. 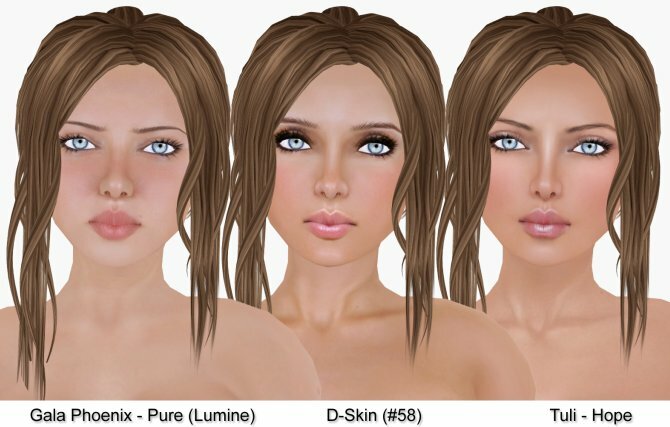 I think, all of these skins are really well done but if I could pick and choose, brows from one skin, and lips from another, the combination would be my ultimate dream skin. gala lips, tuli eyes, and d skin brows..
You look *absolutely gorgeous* in every one of them. Actually, you look gorgeous in *everything* you’ve ever posted. (*wonders how she does that! *) Imho, the Gala skin gives you a younger, fresher look, while the Tuli skin gives you a more polished, mature look. The look of the D-Skin lies somewhere in between (good choice in photo placement). I just wish I could wear the Gala skin. It makes me look angry, no matter which shape I use. (weird, I know). Desiree, you should try changing your bald(hair) cap. It’s not the shapes that really mess with eyebrows its the bald cap. Tuli has evolved a lot. I love how she is constantly improving her line. I would like to see fresher lips on her line sort of like the Gala skins.